Light and durable aluminum body construction. Available with or without brake lock. Light and durable aluminum body construction. Heavy duty and low profile. Twin wheel caster with excellent stability. Available with or without brake lock. Heavy duty and low profile. Twin wheel caster with excellent stability. Adjustable glide with a chrome shell. Features a white, plastic base and chrome metal cover. Can be used with a T-Nut or bracket to install to a piece of wood. Used to install levelers where extra holding strength is needed for heavy pieces. Swivel base levelers will automatically adjust to angled tables or chairs. Features a hex nut on the bottom and slotted top for screwdriver adjustments, with a nylon base. Cabinet leveling is quick and simple using heavy duty plastic leg levelers. Made in the USA. Use these steel levelers with angle and corner brackets for an adjustable furniture glide system. These plastic glides are used in the base of furniture. Nylon twin wheel caster with swivel plate. Capacity per caster is 77lbs. Available with or without brake. Polyurethane/Nylon single wheel casters offer the advantage of two different materials - the strength of nylon construction on the inside and the durability of PU on the outside. The polyurethane surface is fine. Rubber wheel casters with mounting plate. Available with or without brake. 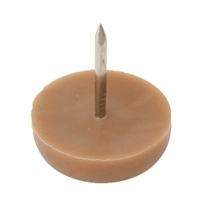 Plastic base nail-in glide used in furniture. Enhanced adjustable furniture glide featuring ABS (common thermoplastic polymer) base, 10mm thick. Non-skid thermoplastic rubber base leveler. Corner bracket levelers provide cabinet frame support. Cushion glide leveler with a nickel plated shell and black high-density polyethylene thermoplastic (H.D.P.E.) base. Compensates for irregularity of floors. Load capacity: 132-1368lbs (60-622kg). Swivel type, heavy duty and low profile. Twin wheel caster with excellent stability.